Hey all y'all Airsoft M14 Designated Marksman Rifle (DMR) owners. Betcha didn't expect me to say, "y'all" did ya? Well I'm glad I could catch you off guard. Today's "Airsoft blog speak" is in regards to performing a procedure that will not only increase the chances of hitting a target with your Airsoft designated marksman rifle, but it also increases the chances of being able to see what you're aiming at through your scope. Turns out, that last part is pretty important, not just for accuracy, but for safety. Some people might think safety is lame. Those are usually the people who end up on the "Darwin Awards." I suggest you not be one of those award recipients. Safety is actually pretty legit. But let's focus more on the accuracy aspect here, because that's not only legit, but more exciting. So it's one thing to be able to "sight in" or "zero in" your scope using the windage and elevation dials that most optics come with these days. However, you're only able to adjust either of those things to a very small degree. They are definitely what I would consider to be a fine-tuning adjustment. If your scope mount is so far off that you can't even see the flight path of your BBs through your glass, no amount of fine-tuning will do you any good. You won't be getting those crosshairs or reticle on target anytime soon. As far as appearances go, you might have the absolute SEXIEST, most intimidating Airsoft gun on the field, striking fear in the hearts of even the most experienced dudes out there, but when it comes down to game time and you have target acquired at 80 yards, YOU SIR or MADAME (As Jay-Z once said, "Ladies is pimps, too"), are essentially, combat ineffective without that scope mount lined up and optic reticle zeroed in. Do not brush yo' shoulders off. Do not pass go. Do not collect a "mirrion dorrars," etc. Alright. So, this particular part of dialing in your long-range Airsoft interdiction tool is only relevant to M14s, or other rifles that don't have an integrated rail on top of their receiver, requiring a scope mount base to be installed. When installing your M14 scope mount base, simply tightening all the bolts included with the mount does not qualify you as "ready to go." These things are not true "plug-&-play" items, as I've said. So how does one go about effectively aligning the mount accurately enough to allow one to fine-tune, or "zero in," his or her scope, using the windage & elevation dials located on the top and side of the scope itself? Excellent question, my dearest Airsoft blog reader. Here is my quick and dirty method. DISCLAIMER: There is more than one way to skin this cat (Figuratively speaking. Relax, PETA). The following method is merely the method that I've used and found to be "close enough" for most Airsoft purposes. (A) A piece of thin string (the smaller diameter the better), a few inches longer than twice the distance from your Airsoft rifle's rear sight post and front sight post. (C) A Ruler, Digital Calipers with millimeter increments, or the ability to accurately "eyeball" distance & alignment. (D) The ability to look at my pictures and replicate my not-so-perfect illustrations. As a reference point for aligning the M14 scope mount base, below, you will see that I took the string (A) and tied it around the front and rear sight posts, and secured the loose ends behind the rear sight with a little alligator clip, keeping the string tight. I didn't want to tie a knot because the string was so thin, that I didn't want to horse around with trying to undo a tiny knot when I was done. As you can see below, I didn't just tie the string to each end of the post because, at the time, I thought setting it up like I have below would net me a more accurately aligned setup. But I suppose in hind sight, you could tie a knot around the front post, and one around the rear sight and still achieve effective results if you took care in making sure your knots didn't interfere with aligning your string properly. So, you should be able to tell that in the "Before" shot on the left, the scope mount base was all out of whack, not in line with my yellow reference string. I then took my digital calipers and measure the distance from the end point on the back of the rail to the reference string, as well as on the front of the rail and adjusted accordingly until I had relatively equal distances, respective to the counterpart, which told me that my scope mount was aligned pretty well and was now ready to have its three bolts tightened to secure the mount in place. This can be a tricky process because there is potential to move the mount out of place from where you had it, while tightening the bolts. I simply kept one hand on the mount at all times, and tightening each bolt with my other hand, making sure not to crank on the bolts so much that it moves the mount. And that's pretty much it, for this portion of the process. 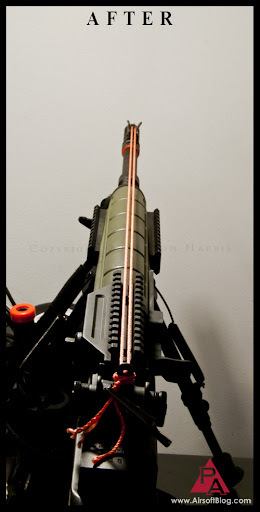 This procedure can be adapted for any number of different M14s, provided they are made well enough and, therefore, allow the user to attach a scope mount base. The following are M14 options that I either know for certain, or can guess will high probability, have the option of adding a scope mount. This is not an all-inclusive list, so don't freak out if your favorite M14 is not listed. The next step is to attach your scope and zero-it in, which we will get to in due time. 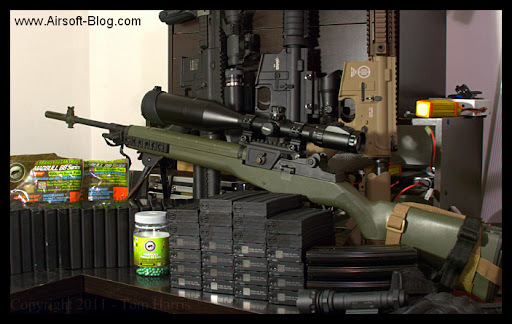 This is multi-faceted, so I'll try and tackle as much of this entire process as I can to give you a complete picture of what is involved in setting up an accurate Airsoft designated marksman rifle. Lastly, who's going to Operation: Lion Claws X this weekend? I know there are 500+ other players that signed up. I'm stoked. I've been busy getting all my Airsoft guns and gear squared away, along with the goodies the Pyramyd crew & I will be giving away at our booth. I'm bringing a plethora of guns, including, but not limited to my M14 DMR, VFC HK416, VFC M4CR, SOCOM Gear PWS Diablo, and, clearly, enough mid cap magazines to dump a lot of BBs on the OPFOR, who in this case, is Alpha Company (tan). We'll be running on Bravo Company (Woodland). If you're going, and you're reading this, and you're not Dave, Mike or Ben, stop by the Pyramyd Air booth, sign up for the Pyramyd Airsoft email updates and be entered to win a $100 gift card from Pyramyd Air. We're also giving out some pretty serious coupon codes to get you that fatty discount on Airsoft stuff that you've always dreamed of. So come hang out with me and my boys at the Pyramyd Air booth. It's cool if you only show up to get free swag. But I will warn you, we know how to have a good time, so you may end up wanting to stay and hang out for fear of missing out on something cool. Or not. But now you're curious either way now, aren't you?